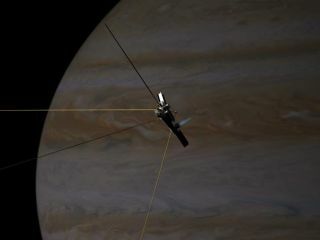 Artist’s concept of Interstellar Explorer swinging by Jupiter en route to a heliocentric distance of at least 200 astronomical units. To send a spacecraft where none has gone before is a dream assignment for any space scientist and engineer. The idea of dispatching a dedicated robotic probe on an interstellar trek has been seriously advocated for nearly 30 years. A recently finished appraisal of how to build such a craft shows that it is within reach -- but nonetheless remains a challenging task. A NASA-sponsored study team has blueprinted an Innovative Interstellar Explorer (IIE). Goal of the IIE would be to plunge outward some 200 Astronomical Units. An astronomical unit (AU) is the mean distance between the center of the Earth and the center of the Sun - approximately 93 million miles (150 million kilometers). Put that in your cosmic calculator and you'll get: 18,591,186,595 miles (29,919,614,600 kilometers). No matter how you figure it, that's a lot of infrequent flyer miles to travel. "I think we're converging on something that's doable," said Ralph McNutt, the principal investigator for the Innovative Interstellar Explorer study. He is a space scientist at The Johns Hopkins University Applied Physics Laboratory (APL) in Laurel, Maryland, and also the project scientist for APL's Messenger mission to Mercury. If launched in 2014, the probe would arrive at the 200 AU distance in about 2044. Clearly, along with doses of technology and a requisite high velocity, IIE demands a good deal of patience from awaiting scientists here on Earth. McNutt said the IIE concept has moved forward over the last several years as a NASA Vision Mission project, through a Team X study group at Jet Propulsion Laboratory (JPL), and by way of NASA Institute for Advanced Concepts study grants. "There is always interest in keeping an interstellar probe going through various studies. But the problem that we've always run up against is propulsion. That's because you're trying to pull out all the stops and get out of the Solar System as fast as you can," McNutt told SPACE.com. In sketching out IIE, McNutt said the relatively small spacecraft would use radioisotope power sources that energize small electric thrusters. "You need to make a spacecraft that is ?massless' as possible," he said, something akin to "unobtanium". Still, in taking a hard look at conjuring up an interstellar probe -- and the kind of science that could be done by the craft -- things do look promising. "We can start building them tomorrow, if we had the money," McNutt said. Efficient, lightweight electric propulsion and power systems are part of the key. The Innovative Interstellar Explorer would carry a compact science payload weighing all of 66 pounds (30 kilograms). It would be boosted from Earth atop a Delta 4 heavy launcher. A custom upper stage is also required. That initial launch energy in 2014 would push IIE to an arrival at Jupiter two years later where the probe would acquire a gravity assist from the massive planet. Long-term, low-thrust, continuous acceleration of the probe would be provided by a kilowatt-class ion thruster running off electricity provided by advanced Stirling radioisotope generators. The interstellar probe would cruise out of the solar system at about 7.8 AU per year. It would accelerate to a "burnout" speed of 9.5 AU per year at 103 AU in November 2029. In contrast, Voyager 1 is speeding about 3.6 AU per year. Its twin, Voyager 2, is a slow poke at about 3.3 AU per year. "The IIE would end up being at 200 AU in about 2044," McNutt noted. "Yes, I know that sounds like a long time from now. But you have to keep this into perspective. When we started out with the Voyagers, none would have believed they'd still be going," he said. In fact, the dual Voyager spacecraft launched in 1977 are now dubbed the Voyager Interstellar Mission (VIM), investigating the outermost edge of the Sun's domain ... and beyond. The Voyager probes are expected to go dead around 2025 as their plutonium-fueled generators are fully discharged. The 30-year mission by IIE to address fundamental scientific questions about the interaction of the Sun with the interstellar medium, McNutt said, can only be answered via on-the-spot measurements that such a mission would provide. "The idea here is to try to get as close to true interstellar space as possible ... past the heliopause and past what we think is an external bow shock," McNutt pointed out. But traveling for three decades to do so is tough going. "Designing something that's going to be good for 30 years ... that scares the daylights out of people," McNutt admitted. "How to qualify all the parts for decades of lifetime is a hard problem. But it's something that we're going to eventually come to terms with. We'll figure out how to deal with it." Pumping back science data from afar is also a challenge. And Earth will also have to keep up its end of the bargain. Already in the works is a hoped for upgrade of NASA's Deep Space Network, turning huge antenna dish complexes into "receiver farms" -- that is, multiple numbers of smaller antennas. That could enable reception of downlink signal from IIE of about five kilobytes per second out at 200 AU, McNutt said. At some point, as IIE keeps moving onward and outward, it will increasingly become more difficult for ground controllers on Earth to reprogram the spacecraft's onboard data processing unit. "The probe will then have to decide for itself when to phone home. It's not going to be you asking for the call," McNutt said. The recent chorus of disapproval about turning off the long-distance Voyager craft may be a good sign of support for interstellar probe development. The very idea of shutting down the venerable Voyager probes to save a few million dollars per year sparked public and Congressional comment. "I can't answer why there was an outcry," McNutt said, "but I'm certainly glad there was one." Indeed, Voyager 1 relayed in May evidence that it reached the heliosheath - an area just where the solar wind crashes into the thin interstellar gas of the galaxy. In a House of Representatives hearing last month, Congressman Vernon Ehlers of Michigan implored NASA chief, Michael Griffin, to keep a scientific ear attuned to Voyager. "It seems foolish to wait all these years to reach the heliosheath and then suddenly pull the plug," Ehlers told Griffin. "I assure you that I also think it's rather dumb to be turning off Voyagers 1 and 2," Griffin responded. Nonetheless, a NASA assessment on what spacecraft will be kept in operation and which ones will not is to be wrapped up later this year, he added. While the Innovative Interstellar Explorer is a real study, not real hardware, McNutt said the reviews are favorable for such a probe to be lofted within a reasonable period of time. "This would be a stepping stone. A lot of people resonate with the science fiction side about taking the first step to the stars," McNutt said. Given a go-ahead, McNutt senses that the Innovative Interstellar Explorer could be done for less than $2 billion. While some might consider that inexpensive, there would also likely be a debate about whether the first dedicated step to the stars is worth it, he said. "Basically, it's kind of like throwing a note out in a bottle ... throwing it out to sea and seeing what comes back," McNutt said. "If we really want to understand the world around us, we ought to be out there making those measurements."